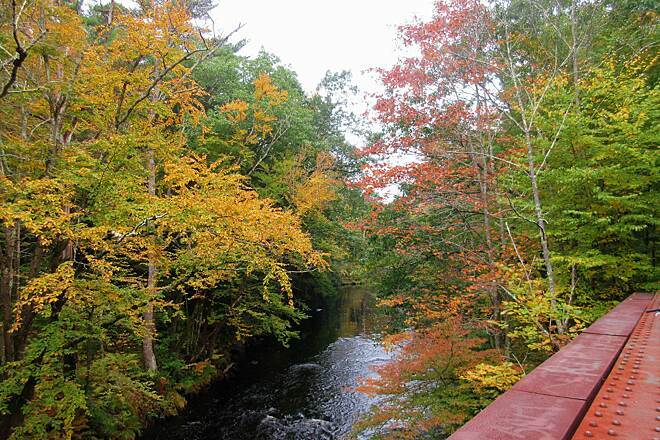 The Rockingham Recreational Rail Trail brings at least two superlatives to mind: it’s one of New Hampshire’s longest rail-trails at just more than 28 miles, and it begins in Manchester, the state’s largest city. 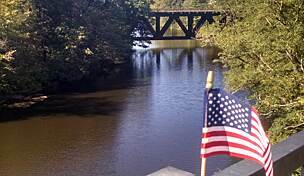 Travelers will find lakes and forests here, as well as former mill towns where they can stock up, relax, or visit historic buildings and relics left over from the railroad days. The Boston and Maine Railroad was the last to run trains on the Portsmouth Branch between Newfields and Manchester, selling the corridor to the state in 1988. 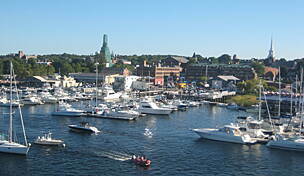 The oldest railway section dates to about 1850 and was built by the Portsmouth and Concord Railroad. Succeeding railroads finished other sections of the Portsmouth Branch to Manchester in the early 1860s. The eastern section of the branch from Newfields to Portsmouth is still in service, while service to Epping, Raymond, Candia, Auburn, and Manchester ended in 1982. The first 2 miles of trail in Manchester are scheduled for paving by the end of 2018, while gravel or crushed rock covers the rest. There are few at-grade road intersections east of town, as the old railbed passes beneath the roads. Some of these underpasses have low ceilings, however, as the bottom of the culverts are planked with wood, so cyclists and equestrians should be prepared to dismount. In winter cross-country skiing, snowshoeing, snowmobiling, and dogsledding are permitted. 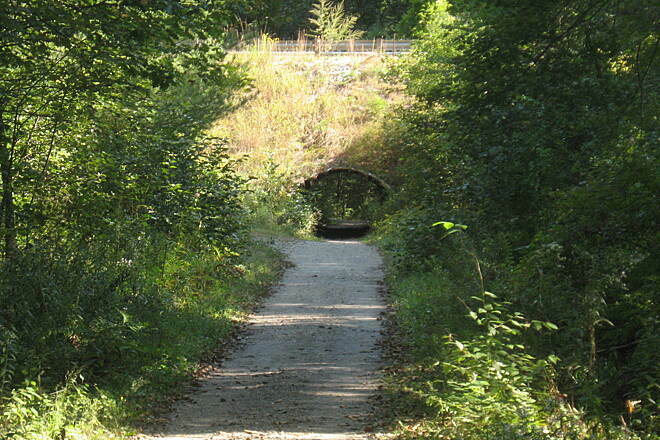 Beginning on the paved trail at Mammoth Road/SR 28A, you head east for 0.9 mile to a tunnel under I-93/SR 101. The packed gravel starts at Lake Shore Road (mile 2). 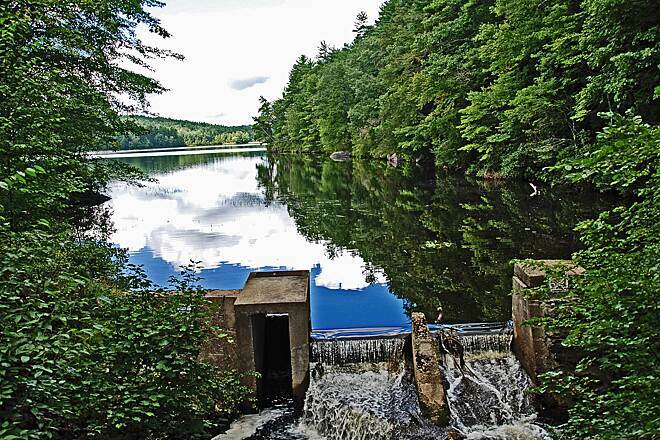 In another 0.5 mile you arrive at the trailhead for 2,500-acre Massabesic Lake, the source of water for Manchester. 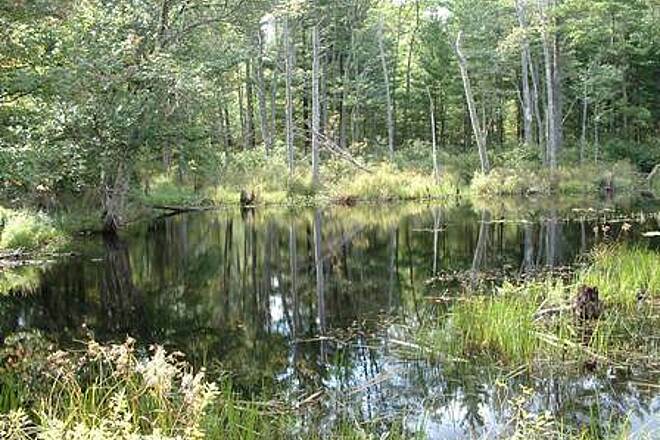 It’s also home to deer, fox, loons, and other wildlife. 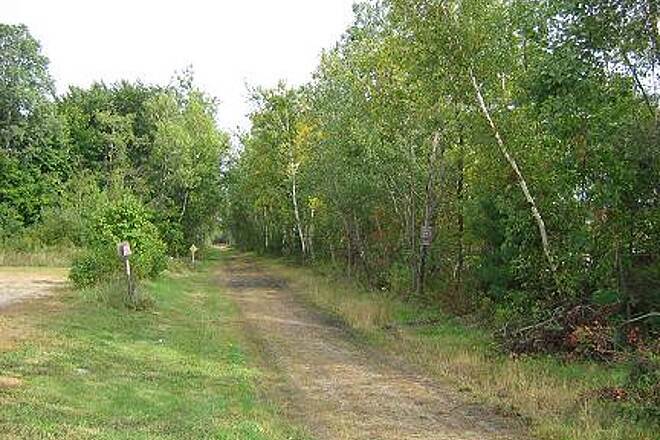 This is a popular trailhead for the rail-trail because of adequate parking and the scenic location. Motorized use is prohibited west of here in Manchester. 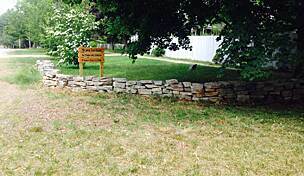 About 8.5 miles from that trailhead, you’ll cross paths with railroad history at a marker for the demolished site of an 1889 railroad station on Depot Road in East Candia. 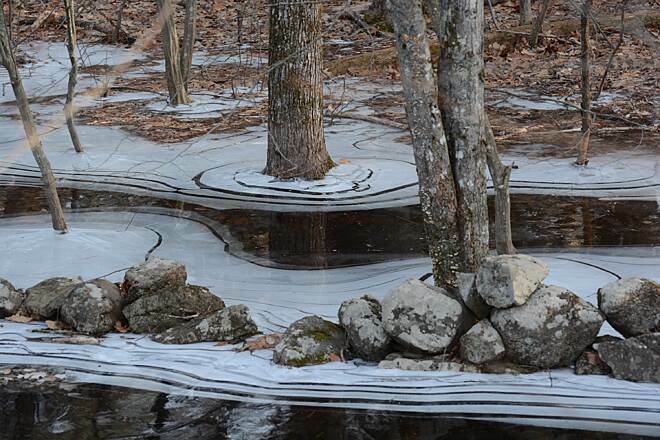 The railbed rises above the forest floor in places here, while other stretches thread through high-walled cuts blasted through New Hampshire’s famous granite. 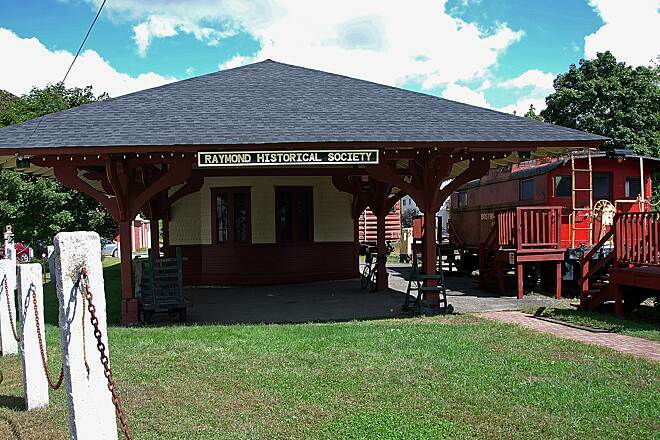 From East Candia, you’ll travel 4 miles to a surviving railroad station in Raymond. 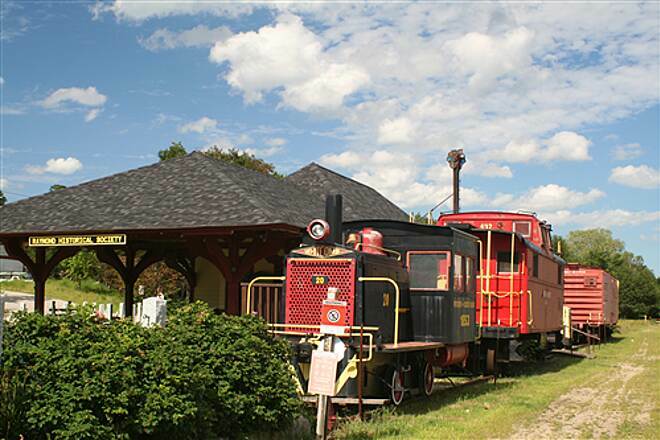 Originally built in 1893 and restored by the Raymond Historical Society, the station features local museum collections inside and railroad relics, such as a locomotive, a caboose, and a push car, outside. You’ll find plenty of places for food and refreshment near the depot and on the outskirts of town in 1 mile. 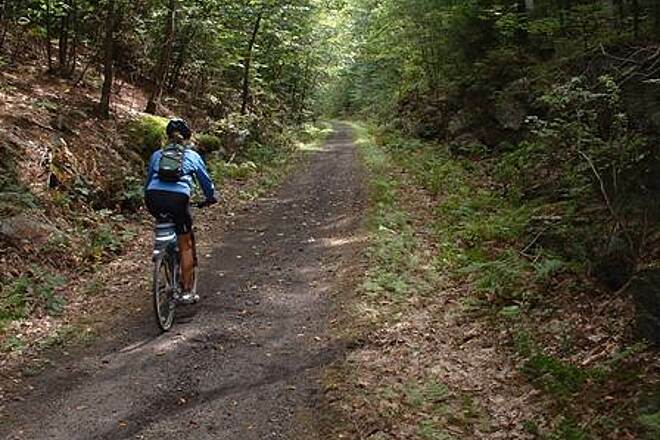 In 4.7 miles the trail passes through Epping, where you’ll find more services and a junction with the Fremont Branch of the Rockingham Recreational Rail Trail, which heads south a little over 18 miles to Windham. 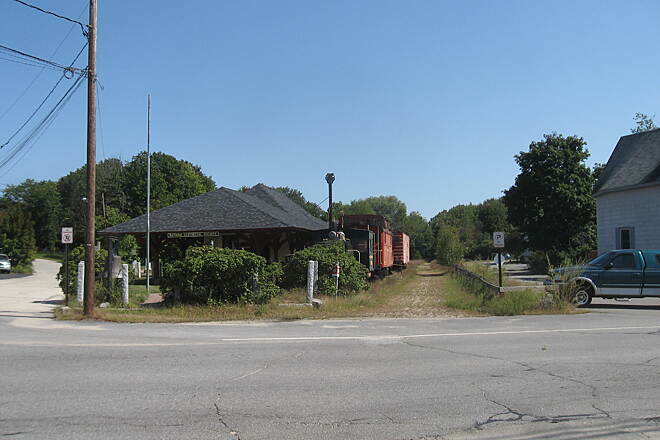 The last 7.3 miles passes through more forestland and ends at the still-standing circa 1891 Rockingham Junction railroad station, which served the Boston and Maine Railroad’s Main Line and Portsmouth Branch. Trains operated by Pan Am Railways still pass this station. 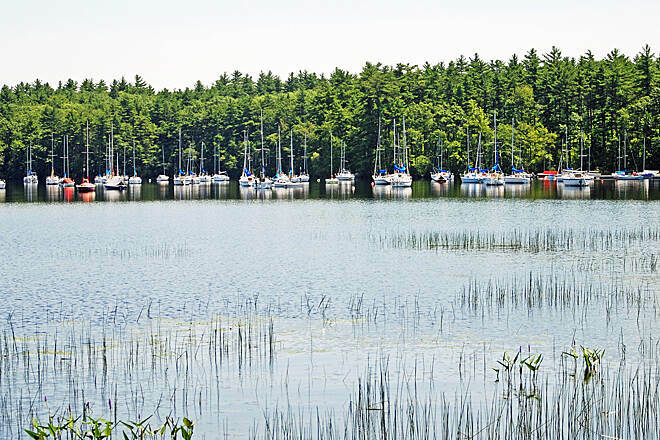 While a small parking lot is located at the western end of the trail, the best place to park is at Massabesic Lake, which has ample parking. 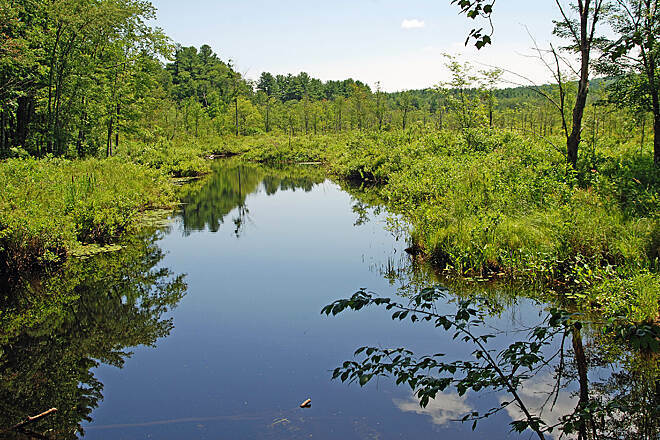 To reach the Massabesic Lake trailhead from I-93, take Exit 7 onto SR 101 toward Portsmouth. Head east 1.5 miles, and take Exit 1 onto SR Bypass 28B/Londonderry Turnpike toward Auburn. Turn right, go 0.3 mile, and turn right into the parking lot, just after the traffic circle. The trail begins 2.6 miles west in Manchester. 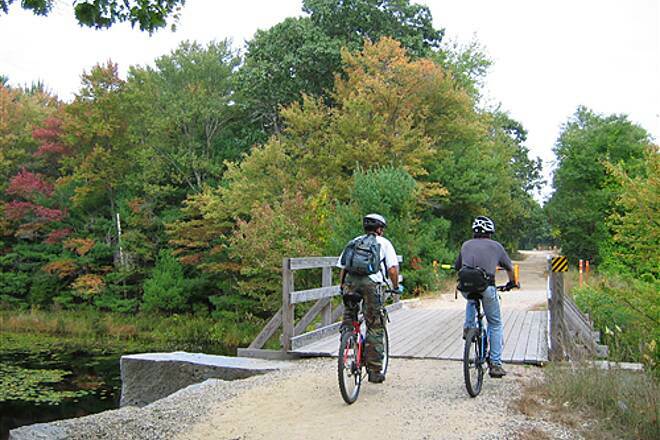 To reach the Newfields trailhead from I-93, take Exit 7 onto SR 101 toward Portsmouth. Head east 25.8 miles, and take Exit 10 onto SR 85 N toward Newfields. Turn left, go 3.3 miles, and turn left onto SR 108/College Road/Exeter Road. Go 0.8 mile, and turn left onto Ash Swamp Road. Go 0.2 mile, and the trailhead and parking are on the right (just before Ash Swamp Road makes a sharp turn right). I did this over two weekends. Went from Manchester to Raymond and back the first weekend, and then did the Raymond to Newfields part the following weekend. The trail seems to have far fewer people in the Raymond to Newfields section and has a nice canopy if the sun is strong. The one thing I would caution is that the crossing at Rte. 107 (Freetown Road) right after Raymond is not great, is a busy road, and wide. It could definitely benefit by having pedestrian markings on the road and a stop light. The other street crossings are much easier. There is a light at the Epping intersection, thankfully. 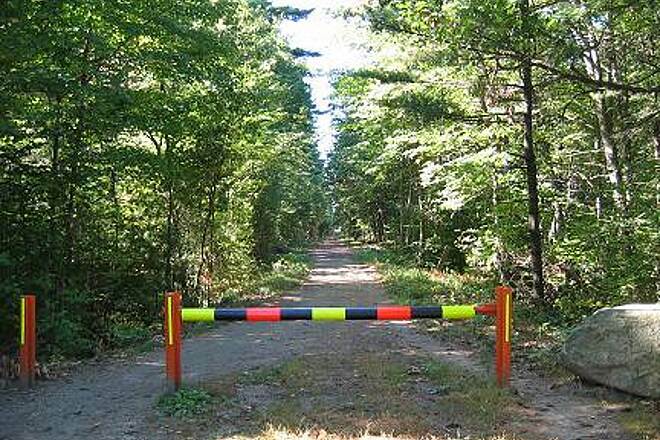 Maybe someone can install one at Rte 107 where the trail crosses. 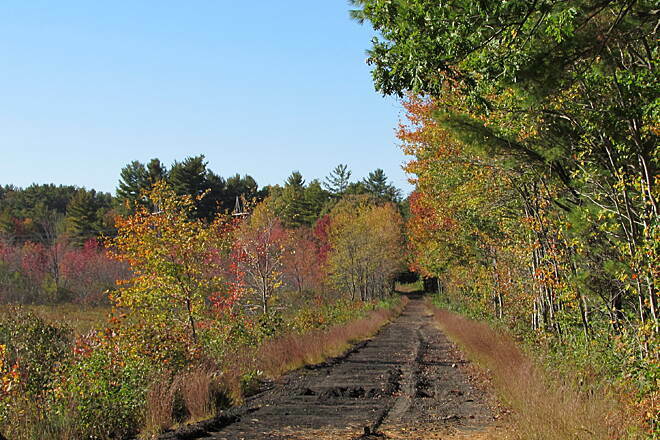 Although a bit longer than expected at 27 miles from Massabesic Lake to Newfields, I didn't mind as most of this trail was secluded, scenic, sparsely populated and draped with fall color this past Monday. I'd suggest a mountain bike as I had, finishing up in three hours, but definitely worth contending with a less rugged bike just to be out there. I Camped at beautiful Pawtuckaway State Park in Nottingham and drove 4 miles to the old train station in Raymond on 2 days to go out and back east to Newfields and west to Masabesic Lake. On the 3rd day I drove to Masabesic Lake, also beautiful, and completed the 53 "round trip" miles by going from the lake to Tarrytown Road in Manchester and back to the lake. 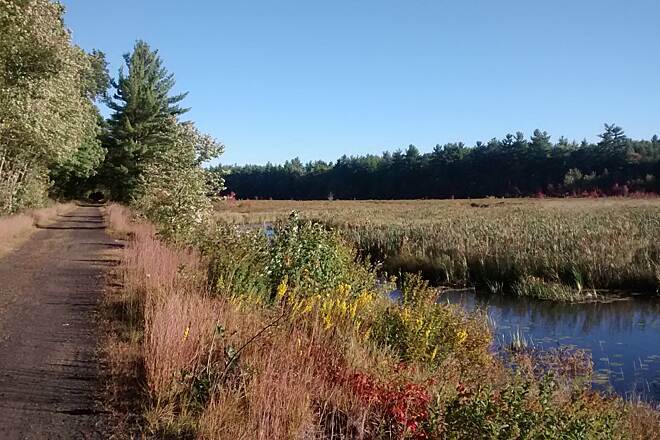 The trail from Masabesic Lake east to the Newfields railroad depot was in bright autumn leaf colors made even more scenic by the many wetlands on each side of the trail. At times the trail is like a "tunnel of trees". There are several dark culverts under roadways with low clearance. I'd advise to walk your bike and wear a headlamp. The last 2 of about 4 miles going west from Masabesic Lake into Tarrytown Road in Manchester are in very poor condition and I think it's best to avoid. Just do the trail east from Masabesic to Newfields. 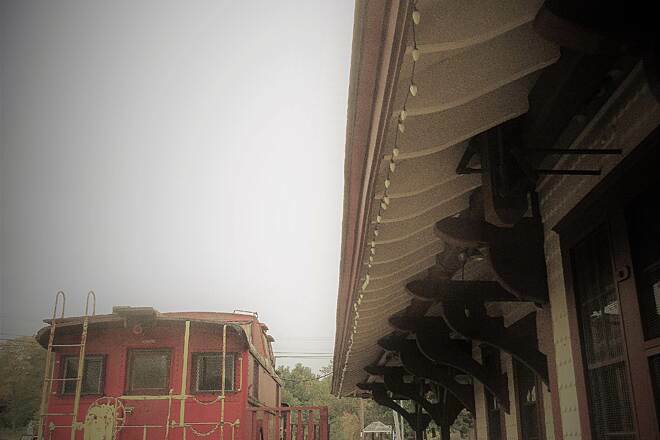 Stop at the Historic Train Station in Raymond and have lunch at the Pizza place across from the station. I did see people riding road bikes and hybrids, but because of the varied surface from a few areas of soft sand, small to medium pebbles, and occasional larger fixed stones protruding 2-3", I liked riding my mountain bike. I've done parts of this trail over the years but did the whole thing, out and back, 54 miles at the end of September 2016. In Raymond you can go off-trail and get some food and water. 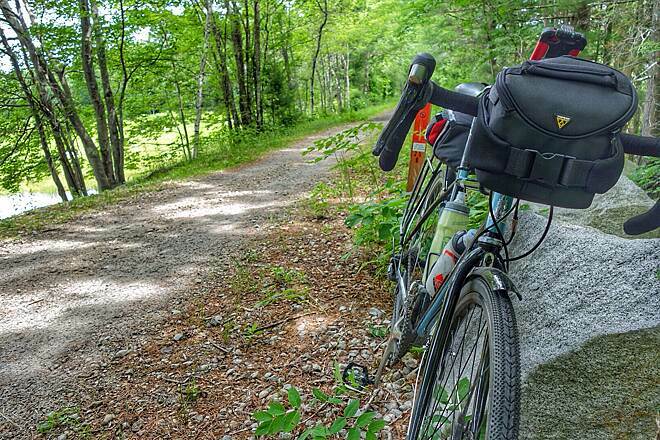 Since this is NH, expect a few rocks and roots in the trail, but mostly it is hard-packed dirt and mostly flat. Particularly at the western end these obstacles are spray-painted bright orange to get your attention (less so at the eastern end). Thank NH snowmobile clubs for trail maintenance. 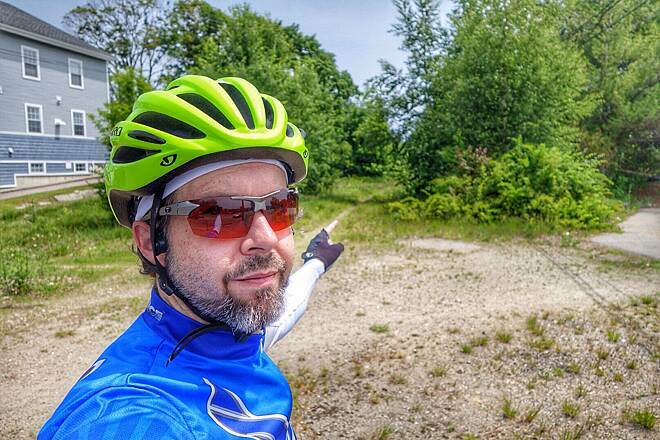 I did hear a dirt bike on the trail that should not be there. Along the way you pass through three very short tunnels under roads unless you detour around them. They are about 5-foot high culvert pipes with wooden boards and dirt making up the floors. They are dark inside so go slow or walk your bike. I rode slowly through each one without problem, just hunched over a bit. 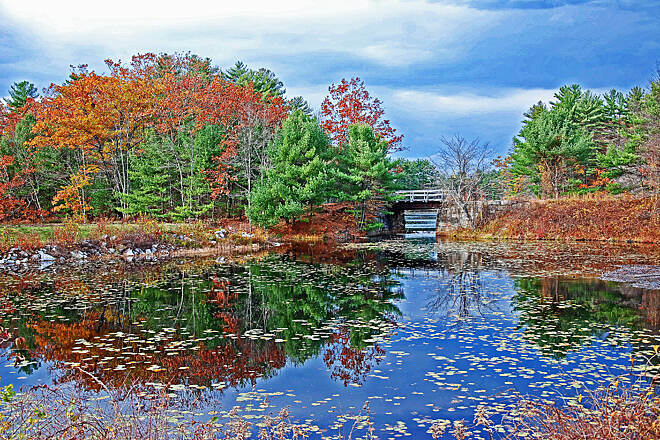 There are some beautiful wetlands and forest views, particularly during foliage season. 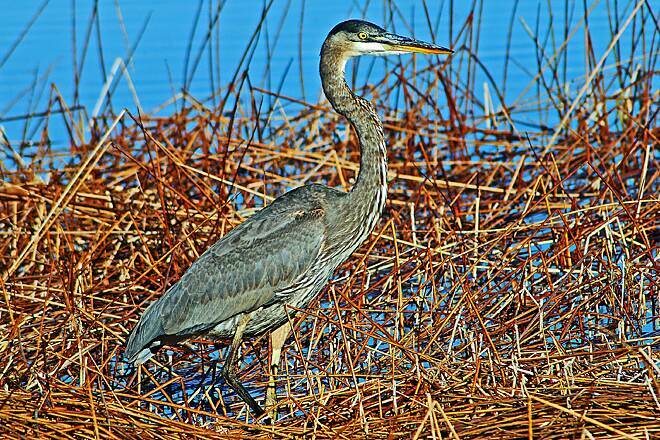 Also good for bird-watching; I saw a couple herons and ducks. This is my second time on this trail and did the entire length. It is relatively easy given the flat terrain. There are a few things to watch out for. The first 7-8 miles out of Massabeesic is rocky. The remainder of the trail is nicely groomed. Also, watch out for the time of day you go. I left in the morning and while riding east the sun made it difficult in parts to see the terrain. It did not help that it is heavily wooded as the dappled shade added some complexity being able to see rocks, dips, etc. Otherwise this is a good trail to ride on. As noted already, there are a number of tunnels. You can ride through them but they are dark while 3 of them have low ceilings. A few of us hit the Western end of the trail first thing in the morning and spent most of the day travelling East to the end. Definitely one of the most enjoyable to difficult adventures I've ever done! For anyone looking to walk this whole trail in one day, I recommend identifying rest stops along the way (restaurants, stores, and mark the milage on a print out) because I know seperating this journey into sections was very helpful to our motivation, is: only 8 miles until we reach the store for a water break," only 10 miles until Holy Grail so we can sit and eat." Beautiful scenery, forests, lakes. For our adventure, we parked a car at the end of the trail and then drove back to the beginning once we completed the West to East walk. A group of us have been riding this on occasion at night, and it's a great section of trail. Some places you would swear were paved! You will come across rocks here. 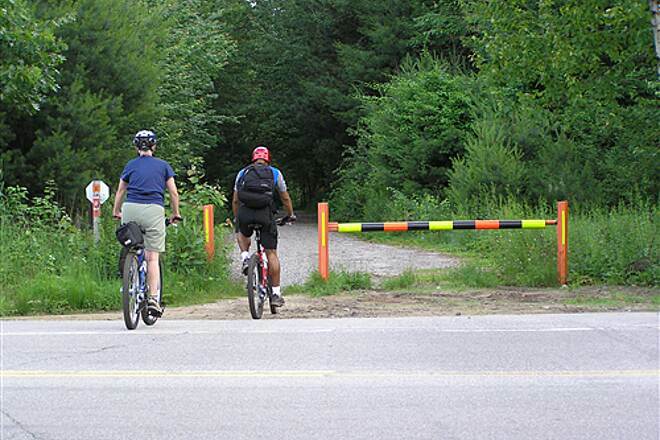 In most places the trail can comfortably fit two cyclists side by side. Very enjoyable stretch. Big shout out to the snowmobile clubs which have been keeping these trails maintained for years, well before off roading for bicycles was popular! 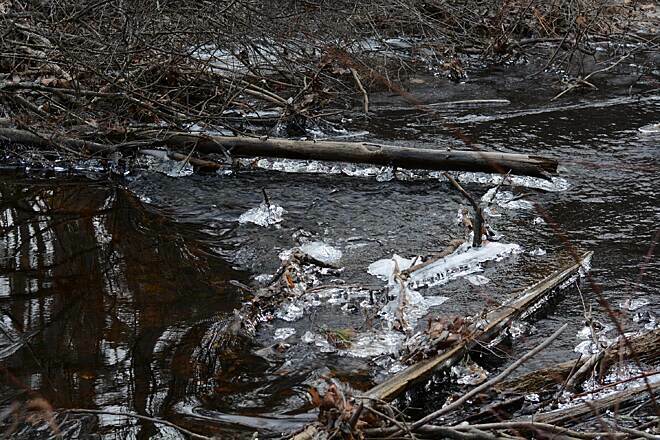 As one of those former snowmobilers, I understand the amount of work that's needed to keep the trails passable. Well done! The Manchester trail organization Manchestermoves.org reports they raised enough funding to buy a culvert for the Peabody Ave underpass. Satellite phots show that it was installed, and if some further trail clearing ahs been done, this would open the trail from Lake Massabesic to at least Candia Rd. 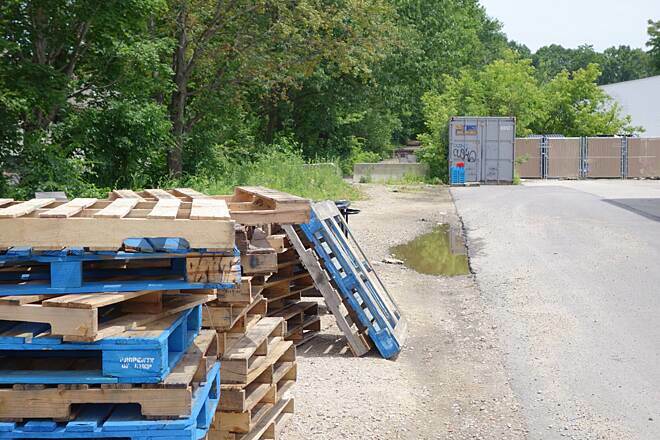 After crossing Candia Rd hopefully the jungle of weeds was cleared to make it passable to get to just West of I-93. While the map tends to show the route from Candia Rd to Massabesic St as existing, I doubt seriously that part of the trail is improved, or passable. Local residents report it strewn with debris. I know for certain the section from Massabesic Street down to the connection with the South Manchester Rail trail is highly interrupted with debris, brush, trees, fencing and city placed obstacles.I am planning a trail ride to find out just how good the trail is from Lake Massabesic back into the city, or just how far it is usable. 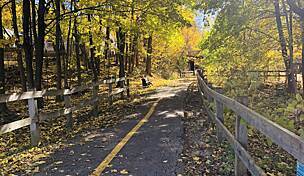 Other than some articles about homeless, and other undesirables, using the trail section between Tarrytown Rd and I-93, Manchester seems to ignore this trail as worthy of even recognition. 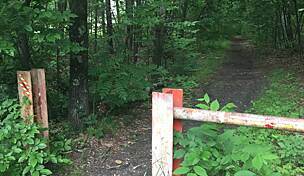 Most consider the trail starting at Lake Massabesic and heading East, and that is because West of that is a jungle of weeds, bushes, trash, and debris. Then to top it off, though the trail supposedly is for Rail Trail use between Downtown Manchester and Newfields, Manchester seems to think it is theirs to sell off for private use. They allowed Elliot hospital to take over a major section for an employee parking lot, and build a Doctors Complex on top of it at Massabesic St, and it was reported recently that they were negotiating to sell the part that runs behind the former Hoitt furniture (Valley & Wilson), and they turned another section into a parking lot for city employees at the new Municipal Complex, and further down the line they allowed Silver Towers apartment complex to make it a parking lot that requires a coded entry to even enter or pass through. And they did all this without even a wimper from the citizens. 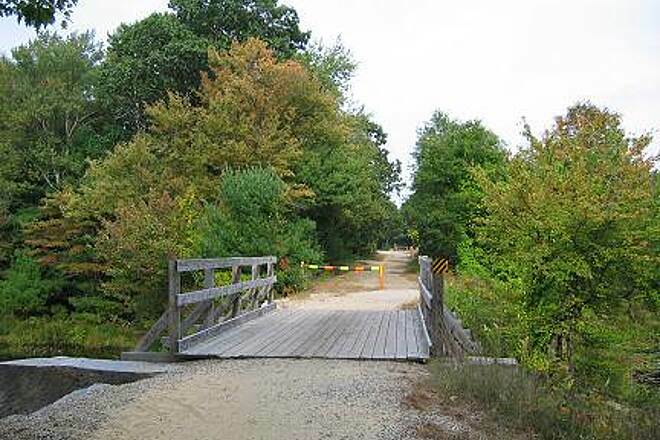 With those obstructions removed, this trail could not only have connected with downtown Manchester, but the South Manchester or Nutts Pond Trail, The Manchester Riverwalk, and the Piscataquog/Goffstown Rail Trail. Sorry, but it just infuriates me that Manchester is more interested in money than its citizens. Happily I live 0.8 miles from the Newfields side of the trail and ride it 4-5 times a week. The trail is well kept and shared by riders, dog walkers, and horseback riders. The horses leave divots and poop that I could live without but overall it is a beautiful ride. Gentle hills not more than 2% up or down (since it is an old railroad track) are perfect for my bum knees. The foliage is lush most of the way. The trees provide a nice canopy. There are several roads to cross and most of the time there are no cars to be seen except at the more major roads. Looking forward to fall and buying warm riding gear! 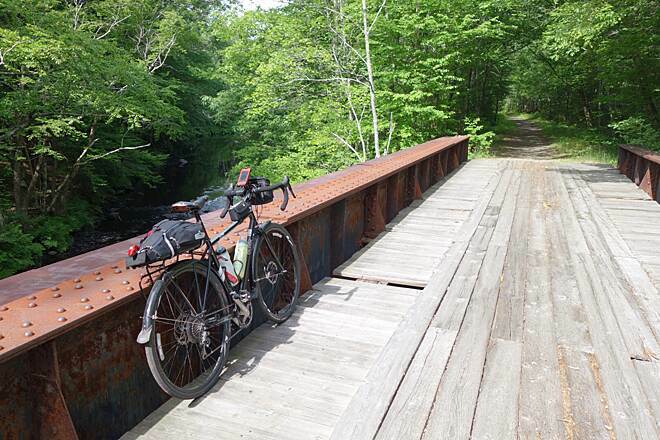 I rode the entire trail yesterday (27 June) as part of an entire day ride around NH. I took my Raleigh Tamland 1 with Clement 35c's thinking that would be good enough. I started at the Stratham end and went all the way to the very obscure end in Manchester. 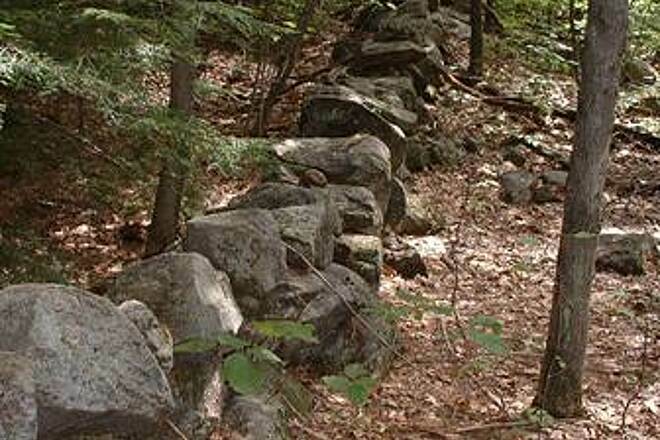 It was very grueling, I think I now know what the "Rock" in the Rockingham Recreational Trail stands for. I did run across a handful of mountain bikers and some hybrids around Massabesic Lake, but they were most likely riding a short distance. There are decent stretches and the scenery is excellent, but for me I had to stay focused on the trail in order to bypass the rocks so I missed most of the scenery. I am a lot more used to the Eastern Trail sections in Maine. I ride that on my road bike a lot (28c Gatorskins). If you haven't done the Rockingham Trail or the Eastern Trail, I suggest you do the Rockingham first. I rode the trail from East to West and did double back the final 6-7 miles to catch a road north for my return trip. On that stretch from West to East, I noticed that the bridge crossings had a better grade leading up to the bridge timbers. Going East to West, you have to bunny hop pretty much all the bridge timbers as they stick out about 2-3". I never paid attention to the other side, I can comment on the grade for the remaining bridges. I did read a review about carrying a bike light for the tunnels. That is great advice as the 101 tunnel is very long and dark, the other tunnels are a mix of timbers and even one low culvert with the galvanized ridges, rocks, and bolts exposed (I saw them in the light). It would not be a good event to go down in that culvert. I am glad I did the trail, I was hoping for a decent enough route for more East to West rides, but I will treat this as a bucket list event and stick to the road from now on. With all that said, I may throw on my original Clement 40c's and try a stretch with severely underinflated tires to see if that helps. Just want to see the route. Would be happy to contribute when I decide the ride. I mountain biked from Massabesic lake out past Raymond and back. The scenery was really nice in some spots. The trail got a bit monotonous in some places, but these were rewarded with other really great views. I want to go back with an earlier start and ride the entire length. One thing I noticed is the length of the trail has manhole covers, some sticking up a bit. I think they are part of the fiber optic lines that were run underground along there. Kind of of killed the charm for me. I also recommend bringing a flashlight or installing an app on your smart phone for passing through the tunnel that goes under route 101. It's pretty dark in there at the half way point. Compared to most of the other rail trails I rode this summer, this one is the least remote and you'll never feel like your in the middle of nowhere since there are always houses and the din of cars around you. I prefer the more isolated and quiet trails, so this one gets a 3 from me. We ride this trail regularly and have crossed from Newfields to Manchester and back on many occasions. If you're in reasonably good shape you can cover the 50 plus miles in 4-5 hours. If you want to stop along the way and enjoy the scenic ponds and lakes, plan on a good 6-7 hours over and back. We've ridden cross bikes, mountain bikes and fat tire bikes on this trail and it is in good enough shape for any of the above. The preferred and most common choice is a mountain bike. But you don't need any fancy suspension bike to have fun on this trail. The trail is in excellent condition this summer (2014). 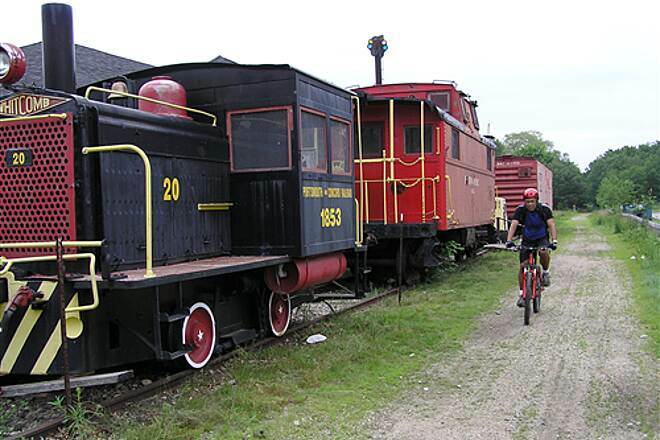 As with most rail trails there are only moderate elevation changes and they're barely noticeable. The surface is a combination of crushed stone with a few sections of hardpack dirt double track. There are sporadic sections with small exposed rock but this is hardly a 'rough' trail. It is in very good condition overall. There is nothing technical about this ride, simply a good aerobic and scenic workout. Having ridden it dozens of times this summer, you rarely see more than a handful of people even riding the entire length, especially starting at the Newfields end of the trail. 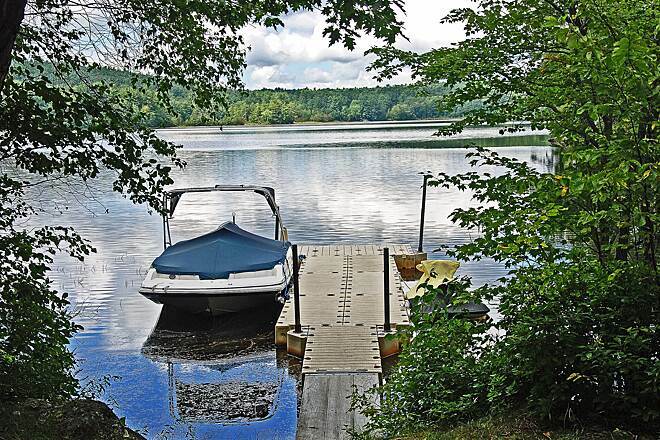 The Manchester end surrounding beautiful Lake Massabesic gets the most use, but it's still lightly traveled. Wildlife abounds in the wooded sections. In the past couple of weeks I've watched a fox pop out trail side with dinner in it's mouth, had an enormous owl swoop down and sit in a trailside tree to check me out, come upon turtles, hawks, raccoons and wild rabbits. Clearly the relatively light traffic coupled with the largely forested surroundings make this an ideal home for a wide array of animals. You definitely feel like you're riding in a natural setting. There are several small town crossings that break up the ride and there's little to no chance of getting lost on this ride. With such light rider activity, you can pedal to your hearts delight (or dismay!) on this trail. Visibility is great over the entire trail, you never have to worry about surprising runners, walkers or other riders. Generally you'll have plenty of time to adjust your speed and the trail is wide enough to accommodate easy passing. The drainage on this trail is excellent. Standing water is rarely present unless we've been getting deluged. I've ridden it in steady rain and it takes a lot of water before any pooling sets in. And unless it's been days of rain, there aren't many 'muddy' sections to speak of. The only time I've really felt mud was an issue was during the early spring when the snowpack had just melted. Even then the trail was manageable, but trickier to be sure with a few short boggy sections. There are several interesting culvert tunnels about half way that allow passage under roadways, but they're easily ridden. The only challenge might be for someone over six feet tall as two of the culverts have wooden plank floors that elevate your bike within the tunnel. You just have to keep your head tucked down a bit and it's clear sailing. This trail has only gotten better with time thanks to local snow mobile clubs that use it during the winter season. I'm sure you can find steeper more challenging terrain in the state of New Hampshire, but for a fun, fast ride through the woods, this trail is hard to beat. Rode about half of the trail length into Candia and stumbled upon the site of the Emerson and Patten wood and shingle mills. The trail was almost abandoned mid afternoon on Columbus Day. It was 62 degrees and blue skies. Pleasant ride with a hybrid (watch the overpass tunnels)and the steep downhill after. Ground was covered with pine straw and some leaves so you have to pay attention a bit. Rode around the mill site. Landscaping was gorgeous and surrounds an almost surreal bucolic pond dotted with hand made two person benches. Worth the ride just to see this site. Moderate foot traffic within half a mile of the Massabesic trailhead but only a few bikers and runners after that. 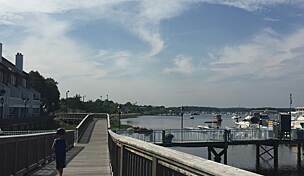 Will do the whole trail into the seacoast area next time. I just mountain biked this entire trail with my girlfriend yesterday (8/26/2013). 25 miles each way = 50 total miles. We started at the western end in Manchester at the free parking lot at Massabesic Lake on Route 28. 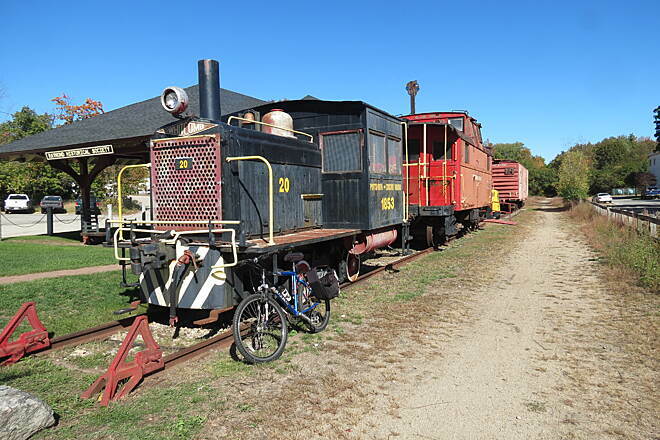 We ended at the abandoned railroad depot in Newfields (free parking is available here as well). Almost halfway along the way is the small town of Raymond. We found the trail conditions to be good to great, with lots of fast riding. Trail was not grown in at all. Absolutely no mud found today. Just a few bugs (horse flies or deer flies, couldn't tell). The entire trail is enjoyable for mountain bikers and doable/OK for those with hybrid bikes. Road bikes will want to stay away. No technical mountain biking is necessary - beginner mountain bikers will do just fine. There were a half-dozen semi-sandy spots, but these were extremely short (less than 50 feet each) and we were able to ride through each of them without getting off the bike. We found the conditions slightly better on the Manchester > Raymond half, so if you have to choose 1/2 of the trail, I would do that half (instead of the Newfields > Raymond half). Nothing really, but if they put down "stone dust" or paved this trail, it would be one of New England's finest rail trails. I rode west to east from Manchester to Raymond and back. I chose the trail head in Manchester where the trail terminates at Tarrytown Road. There is ample parking there, but the trail is very rough in most spots until you get to the Candia Road trail head. Candia Road is a good entry point, but there is little parking there. I recommend using the Massabesic trail head. From there to Raymond the ride is very scenic. I ate lunch at a restaurant in Raymond. I agree with the assessment that the trail is best for mountain bikes rather than hybrids or road bikes. Road the eastern half of the trail (Raymond to Newmarket) and back. Not very scenic (in the woods and people's back yards most of the way) but the surface is much smoother than the Massabesic to Raymond half. Was able to average better than 10mph on my mountain bike. A hybrid could manage it, but would find a few places too rough to ride. Lots of street crossings, some of them pretty major and dangerous (cars are blind to you as they approach from around a corner). The trail was pretty quiet - only saw two bikes, two dogs, two horses, and an ATV. (The dogs and horses were legal; the ATV was not). Rode this trail from Massabesic Lake to Raymond. It was beautiful with lots of nice ponds and wildflowers. My mountain bike handled it well - may be too rough in spots for a hybrid. Trail was in much better shape than when I did it a few years ago. Walked through the tunnels - they're pretty low and dark. 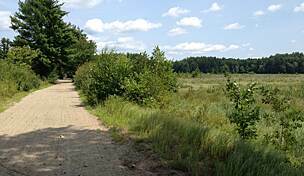 Lots of people walking on the trail within two miles of Massabesic - past there, only saw about a half-dozen bikers. This morning I started at the eastern end (Newfields) and went to the junction of Rt. 27, maybe six miles, on a hybrid. Great ride, but would be a little more comfortable on a mountain bike. Terrain is variable with quite a few areas with rocks to avoid and some parts with bumpy rides. The trail is clearly not maintained much, but it is in good enough shape. A good blend of sun and shade. Bug spray is a must! Gate signs are helpful, particularly for 1st riders of the trail and unfamiliar. Put a sign at the entrance to the depot area, from Ash Swamp Road. Trail needs to be cut back a bit. There are areas where the trees / grass is overgrown and you have to ride through it. Spray paint the rocks to be more visible so the riders can avoid them. All in all, a good ride. I live in Raymond in a 55+ community located less than a ten-minute walk to the trail. It's great for biking and walking. It keeps me off the roads which is just perfect for us oldsters. Easy walk to McDonald's in Raymond center for that early breakfast! I rode this trail on Wednesday, Sept 12. I was a beautiful day and we found the trail head fairly easily on the east side of Manchester. The first half of the trail was rather rough. I was riding my hybrid and wished I had my mountain bike. The second half beyond Raymond was much better. It is apparent that is primarily a snow mobile trail. We travelled over an hour to reach the Lake Massabesic Trailhead to travel the 20+ miles to Newfields and it was totally worth our effort. Weather was mostly dry and comfy. Trail surface varied, made bumpy in places by both protruding rocks and horses' hoof marks. Advise walking the passage tunnels, though we watched someone ride right through one low tunnel without incident. Raymond is the best bet for food though next time we will bring our own. Saw turtles, turkey vultures, hawks, mice, a variety wetland habitats and forest types. Round trip took us nine hours which includes breaks and sightseeing. A GREAT day! 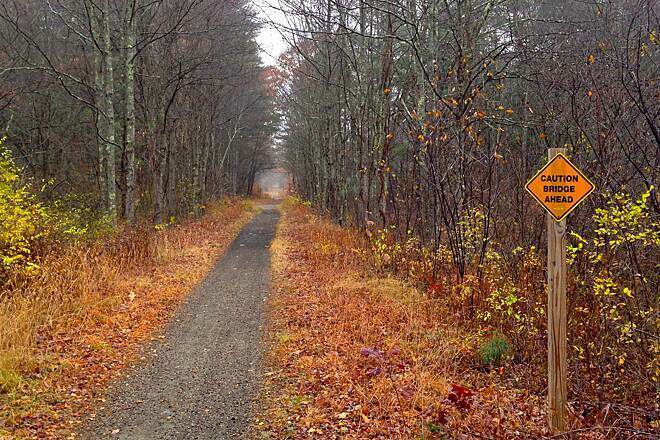 On my trip to New England I stopped off in Manchester and did this trail from end to end. I did it on a Mt Bike but I did see two younger Bikers on Road Bikes, I would suggest a Mt Bike of a Hybrid. I parked at Massabesic Lake which is a beautiful Park. This is a nice Trail but not a great one in my book. There are three tunnel's that are very low and where a little uncomfortable for me. There are no Bathrooms along the way but I found one just west of Raymond at a Baseball field. I am a Race Car fan and it was a Saturday and at Epping There where a couple of cars doing hot laps at Epping Speedway which the trail goes though its parking lot. 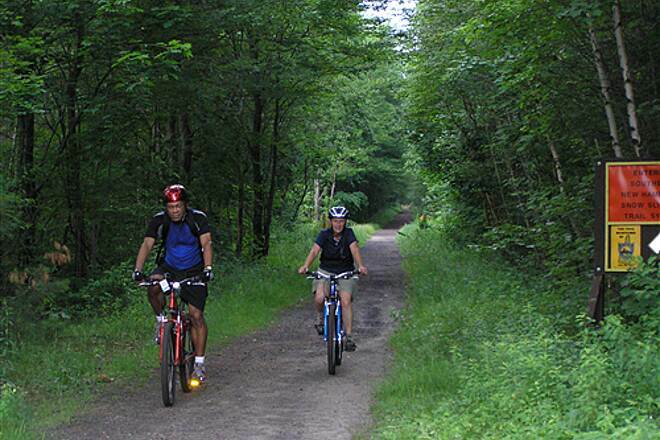 This trail has some very nice elements to it in terms of pleasant scenes and flat easy biking. However there is very little signage, which gets very problematic when trying to find connections. For example, when arriving in Epping from Newfields, I was unable to find the link and ended up just turning back. Also, while there is some notice that ATVs are not allowed, I did run into folks riding these noisy vehicles on the trail, some of whom were going quite fast. In the winter, the value of the trail to cross-country skiing is quesionable depending on how considerate and careful the riders are. I hope more so than the ATVers. It is a good trail, but not great. Well maintained and enjoyed the town of Raymond with it Market on Saturday. Heavy forests with bug repellant a must. I walked the trail for the first time last week. I was alone with my I pod. I did see other walkers, bikers and runners. The path was about 4 ft wide and smooth. There were signs telling who could use the trail. However, I was disappointed that there are no signs telling you what the milage was or where the other trails lead too. It would be nice to know where you are every so often as well. I came to a sign that said what turn to take for chichester and bear brook. I wasn't sure where I was so I turned around and headed back to Lake Massabesic. I plan on going back soon. 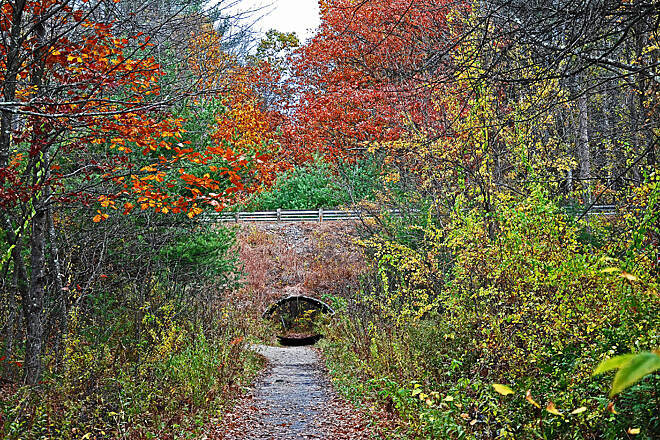 On 11/18/11 I went to the Rockingham Recreational Trail, the entrance located in Newfields, off of Ash Swamp Rd. Upon arrival there are two signs indicating that ATVs are not allowed on the trail. 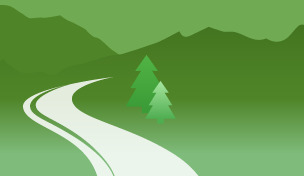 However, on the TrailLink.com web page, off to the right, in a box marked Trail Facts, sub heading Trail activities, it indicates that ATVs are permitted on the trail. 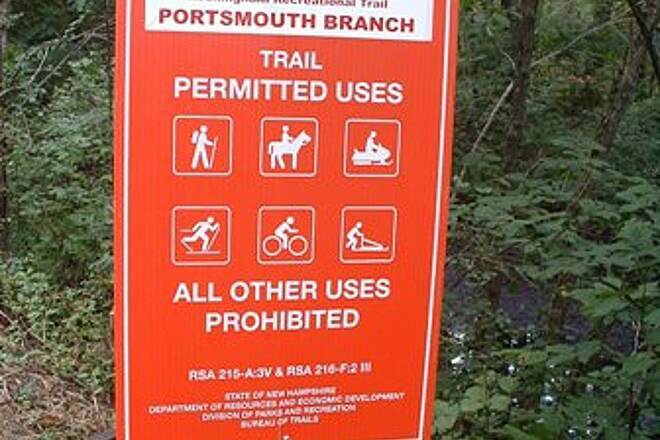 Can anyone tell me for certain if ATVs are allowed on the Rockingham Recreational Trail? My wife and I rode the length of the trail from Newfields, trail head (parking at the old depot parking area) to Manchester, NH Saturday 10/24/2011, stayed the night in Manchester, and returned on the trail back to Newfields Sunday. The trail was excellent, not the best we've been on but far from the worst. 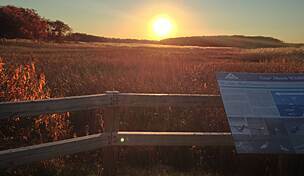 The countryside was beautiful going through marsh land, by ponds, and through the woods. The trail surface is good but there are periodic clumps of rock heads sticking up in the trail and at this time of year with a lot of pine straw and fallen leaves covering them you need to be a bit careful. The towns of Epping and Raymond gave nice breakpoints with opportunities to eat. If you plan to do like we did and stay in Manchester plan on about an additional 4 mile ride through the city streets to get to lodging which seems to be centrally located around the very busy South Willow Street and the mall area. There isn't any lodging nearby the trailhead. Our hotel operated a courtesy shuttle and since there were no airport runs when we were leaving Sunday morning, the driver gladly gave us a ride to the trailhead with room enough for our two bikes in the back of the van. Given the early morning cold and the fact that the ride back was pretty steadily uphill just to get to the trailhead, the shuttle was much appreciated. All in all, we had a great weekend and the trail again is excellent. This is one of only a couple trails I have been on in NH so far and I had a wonderful time. Very scenic and quite peaceful, it is a perfect trail for mountain bikes. It can be rough in some places but I did see a few people on regular street bikes so they must do well. I wouldn't call it "challenging" per se but it's definitely a good workout if that's what you are looking for. Even on a Saturday i was surprised at how few people I saw on the trail. Kind of nice that way but make sure to bring a cell phone in case you need help. To Marianna's point, sections of the trail are very buggy. The deer flies in particular can be a problem during the summer months. Prepare yourself properly before you hit the trail! A nice trail. Too bad it doesn't extend farther east along the Great Bay. Now that would be a trail! Well, I thought I will walk the trail instead of biking. So I started off as planned to walk about 15 miles and then back. As I was walking I thought it was good if I had bought my bike. This is very good trail to bike. The path was good. After about 10 miles on the trail it goes off into the woods which is really wonderful. There are no markers on the trail to give an idea to know how far one has travelled. I carried my pedometer with me so I was able to track the distance. I walked about 22 miles (to + fro) instead of my 30 mile target in about 6 1/2 hours. I had parked my car at the Massabesic Lake.After my long walk I took some rest at the lake reading my book which was very refreshing. Visiting NH from Arizona and found this trail about 1/2 mile from where we were staying. It was wonderful to have such a peaceful and pretty place to ride without all the traffic and the steep ups and downs of NH roads. So delighted that it was there!! Biked it both ways, but not quite all the way to Manchester. It would have been nice to have mile markers or small signs of the street names you cross so could identify where you were. Really appreciated having such a great place to bike ... used quite a bit of insect repellant as lots of bogs beside the trail. Not paved, but hard packed and well maintained! Just moved to Candia, been running/mtn. biking this trail. It's beautiful and a great, accessible trail, but some mile markers would be very convenient to keep up with how far you've gone. Other than that, no complaints, but I'll echo the fact that you definitely want insect repellant in the warm months! It seems after Labor Day the mosquitos aren't so much of an issue. I decided that I would try to walk the entire length. I did and it took me 8 1/2 hours. It is an easy walk. Gravel all the way. Would also be a great bike ride. The trail is much improved from the 2004 post. Easily passable. One area had some water but there was a way around it. There are a few road crossings. In Raymond there is a place to eat. 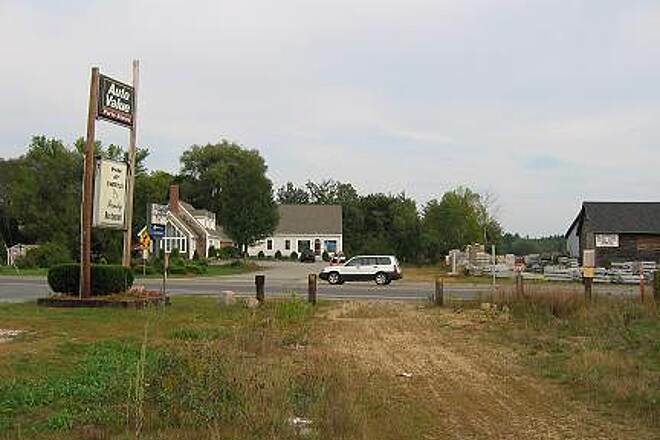 In Stratham there are also a places to eat.The map says it ends in Rockingham but it actually ends in New Fields. 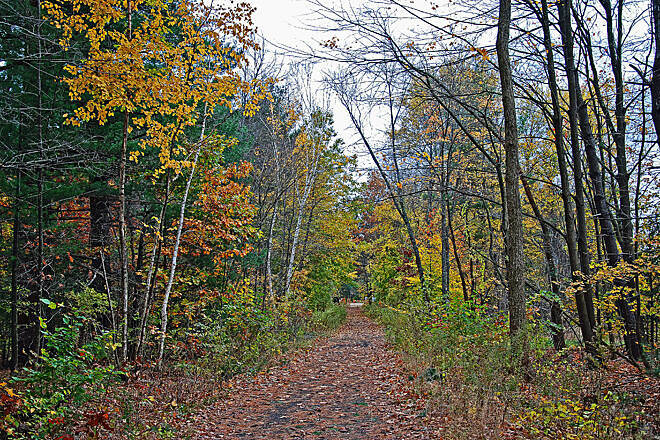 This trail has many other trails off of it in the Manchester area. Didn't meet many people once out of the Manchester area. This Rail Trail basically goes from exit 1, Rt. 101 to exit 11, Rt 101. There are no sanitary facilities along the route other than what you can find in towns along the way. There are a few signs pointing the way to some restaurants and Hannafords. 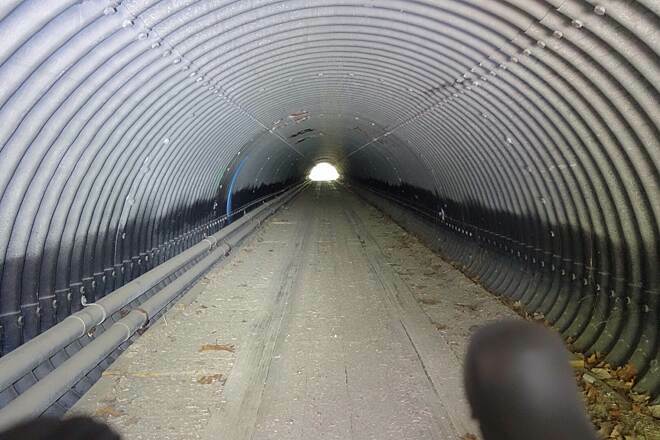 The tunnels have been improved with planks placed inside for snowmobiles. Started walking towards Raymond but was stopped a short distance because the trail was flooded. Turned around and walked towards town. 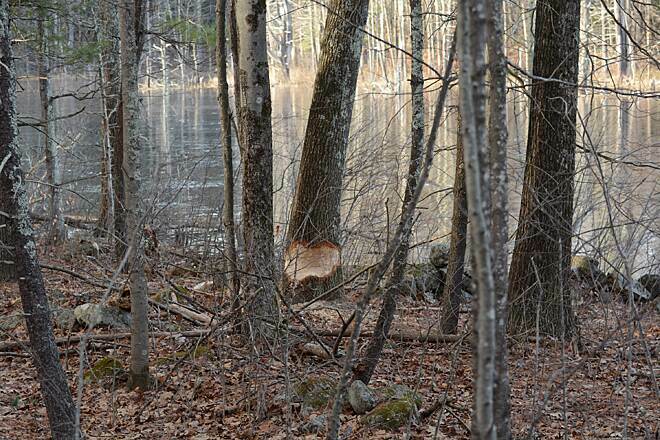 Some work has been done on the trail from Massabesic circle to Candia rd. Beyond that you are on your own. The trail does go all the way to Elliot Hospital but it is not pretty. Am going to try walking to Rockingham tomorrow. "Rode from East Candia to Newfields Yesterday and despite the rain later in the day it was a good ride. We stepped at Raymond for lunch and the Museum (closed) and RR equipment was interesting. The trail is not as developed as some, but this was part of its charm. No mileage markers and signage to find parking was lacking. 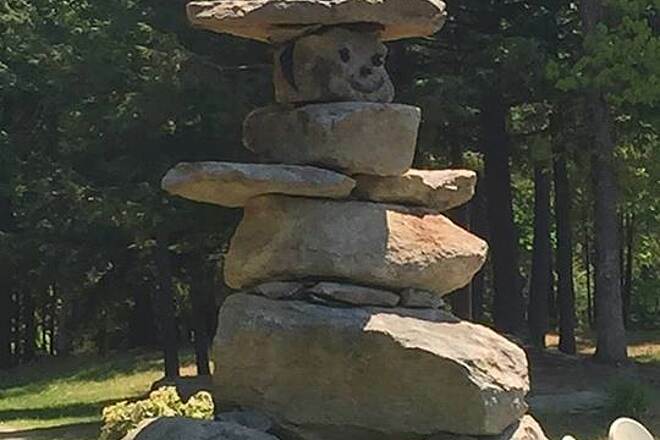 None of the locals knew where it was located. 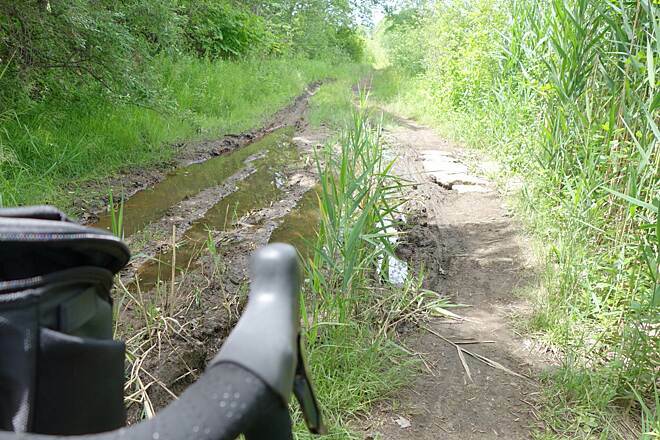 Some muddy short sections, but very ridable "
"My wife and I have ridden rail-trails in 29 states and this trail was a real disappointment. We rode this trail in early September 2004. The trail has great potential since it traverses some beautiful countryside, but it doesn't live up to that potential. It appears that most of the trail maintenance is done for and by a local snowmobile club. We started at the western end of the trail, where we found ample parking. The sanitary facilities at the park (the only ones we saw in ten miles) consisted of one of the dirtiest portapotties I've ever seen. From the parking lot, it is about 100 feet to the rail trail, but there is no signage pointing to it, and the access trail is undeveloped - just paths worn by the many users. 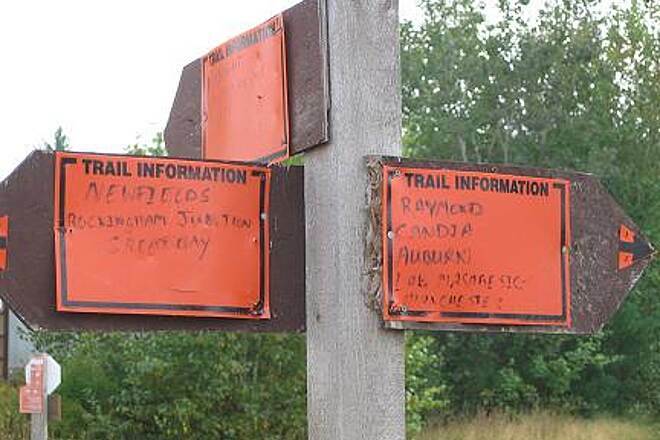 The only signs are on the actual trail itself. They were just little signs telling who could use the trail, symbols for hikers, bikers, snowmobiles, etc. We saw no trail maps, distance markers or other useful information. There was a 45 mph speed limit posted for snowmobiles. 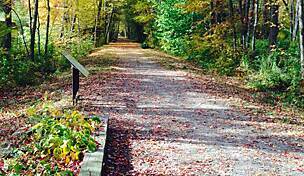 The trail has been converted from a rail bed, and orginally had a coat of crushed gravel. In many places the gravel has washed out, leaving ruts or patches of sand. The worst places have been patched, but the repairs have been done with railroad ballast, making it almost unusable for bikes. One of these sharp shards pierced my mountain bike tire causing a sudden blowout. The three short tunnels referred to in the description are really large culverts under roads. They are dark with uneven surfaces and a moderately steep climb to each of them. It is recommended that bikers dismount before entering the tunnels. This trail has a lot of users. It makes a good running or walking trail, and I'm sure the snowmobiling would be good. Road bikers beware, and mountain bikers be careful. 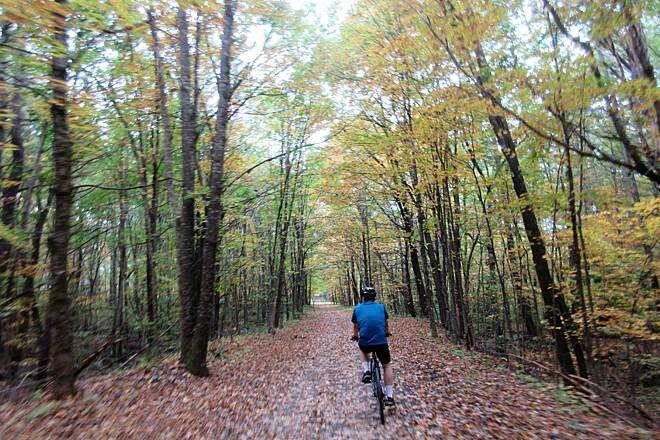 The next trail we rode was the Missiquoi Valley Trail in northern Vermont. That trail is a model of what rail trail can be like. 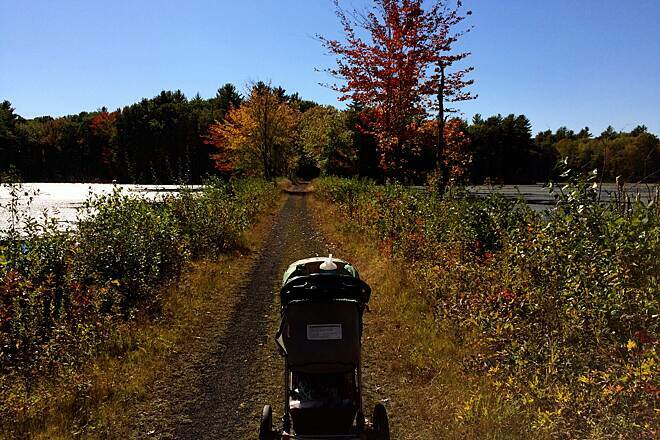 New Hampshire should look around and see what can be done with their beautiful trail." 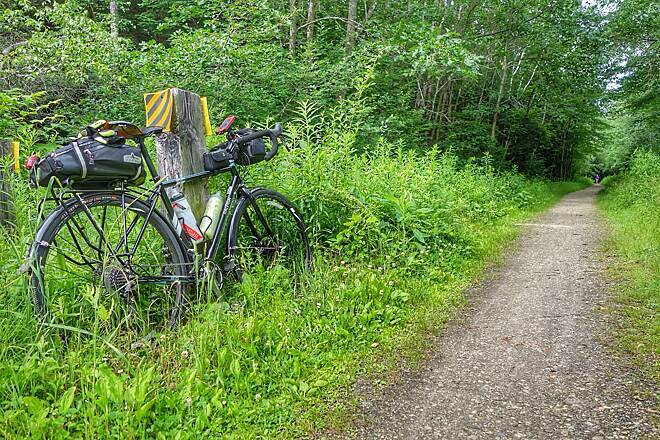 "This trail is an easy but long ride. (Of course you can turn around at any point.) Lots of excellent views of lakes, wetlands, fields and woods. There are a few short steep inclines on the approaches to tunnels which cross highways. And a few large puddles to cross if it has rained recently. The trail surface is smooth and wide. This must be even more beautiful in the fall when the leaves have turned. 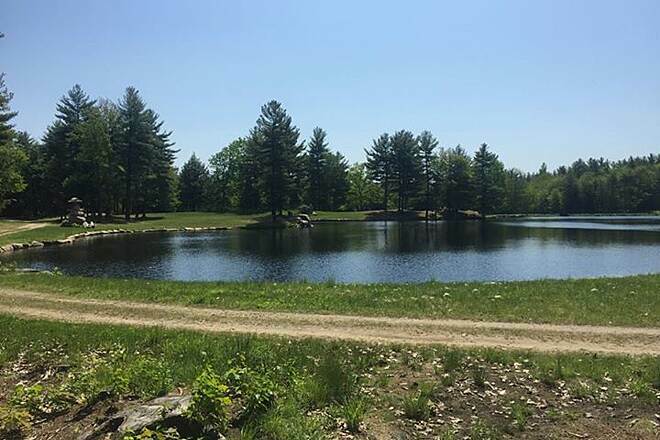 The lake at begining of the trail in Manchester has plenty of parking, picnic benches, a launching area for canoes and is a great place for a picnic etc."